Revision is a big demoparty held each year at Easter, in Saarbrücken, Germany. Whenever possible, it is a custom in the demoscene to release a production dedicated to officially announce upcoming parties: an invitation. Last weekend at the Ultimate Meeting, the invitation to Revision 2014 was presented. The quality of invitations can vary wildly, from rushed and uninspired to works of art (Kings of the playground or You Should are two examples that come to mind); this new invitation is rather on the higher end of the spectrum. Aiming for epic feeling, and nailing it, it imagines a time when the mostly unheard off sub culture has become a dominant one and the reason for a major Super Bowl like event in a Tron like set. How to use light to make better demos? This is the third day at Revision, and my contribution this year is the talk I gave yesterday. Unlike last year, this seminar is not technical at all but focused on the design aspect and, to some extent, how it relates to the technical one. The context is demomaking, but many ideas are still valid in other media. Throwing a new technique at whatever you’re doing is not going to make it any better. It’s only going to change what you can achieve. There are two sides of image creation: the technical one and the artistic one. Different techniques allow to do different things, and the more techniques you master, the better you understand what you can and cannot do with them, and how to do it. Technique becomes a tool that changes how you can express yourself. Here are the slides with notes (~5MB), or a low quality version (~1MB). 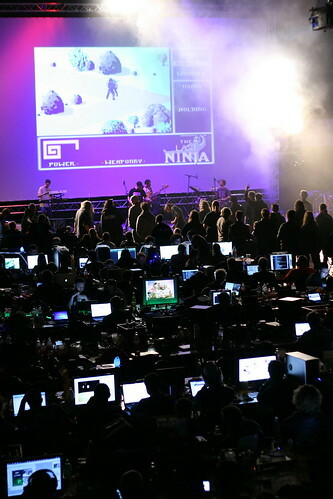 For more demoscene related talks, here is the full list of seminars at Revision 2013. Last year I gave a talk at Revision in which I summed up some of the things I had been gathering on light shading. This year too I will be attending Revision, in Saarbrücken, Germany, and will give a talk about light again. I will present some of the new stuff I learned. This time the topic is going to be focused on the use of light from a design perspective, in particular in the context of demo-making. It will also be an opportunity to improve on the things I wasn’t happy with regarding the performance: hopefully a better diction, flow and construction. Also make sure to have a look to the complete list of talks, there is a lot of exciting stuff scheduled. This article is a crosspost from Ctrl-Alt-Test.fr. I don’t know if this is going to become some sort of tradition for us, but as a matter of fact, we attended all Easter parties since the creation of our group. This year was no exception, and we had a really great time at Revision. Revision is the kind of party that is just big enough so even though at some point you think “Ok, I’ve met pretty much every one I wanted”, when you get home you realize how many people you wanted to meet and did not. It’s also the kind of party that is so massively awesome that when you get back to your normal life, you experience some sort of post-party depression, on top of the exhaustion, and you have to get prepared for when it strikes. So we’ve been there, and this year we presented the result of the last months of work in the PC 64k competition. The discussion of the concept started back in May 2011, and we seriously started working on it maybe around August. While Revision was approaching, rumors were getting stronger about who would enter the competition, how serious they were about it, and how likely they’d finish in time. It became very clear that the competition was going to be very interesting, but even though, it completely outran expectations. It even got mentioned on Slashdot! Our intro, F – Felix’s workshop, ended up at the 2nd place, after Approximate‘s gorgeous hypno-strawberries, Gaia Machina. The feedback has been very cheerful, during the competition as well as thereafter. Also, as if it was not enough, to our surprise, our previous intro, D – Four, has been nominated for two Scene.org Awards: Most Original Concept and Public Choice. Do I need to state we’re pretty happy with so many good news? :) Thank you all! Over the last months I have been reading various resources on light shading, and shared the most relevant ones on this blog. Along the way I became more and more thrilled by how light interacts with materials and how we can model it to get more convincing rendering. I found some insights to be really enlightening and very worth sharing. Therefore as a way of challenging my own understanding of this matter and as an opportunity to practice talk, I decided to speak about real-time lighting during a seminar at Revision. Revision is a big demoparty that will be held during four days over the Easter weekend in Saarbrücken, Germany. If you are coming (which I recommend) and want to hear about shading, specular and Fresnel, come and see me! Update: the talk is scheduled for Saturday April 7th, 14h – 15h. Update: see this post for the material.